Seeking collaborators for a course designed to develop Colombian business leaders’ awareness of how business is done outside of Colombia, how they should interact with foreign counterparts, and how to approach job offers from non-Colombian companies. This course has ben designed for business leaders in Colombia (country managers and departmental heads) who  have a C1 level of English  carry out a majority of their work day in English, and  report directly to someone outside of Colombia. This is not a business English course, and only those students who meet the three requirements listed above. Students will have to go through an interview process in order to be admitted to the course. Who is giving the course? The course will be given by a series of facilitators, each giving a two hour workshop on how business is done in their country. Apart from this, students will also be practicing business presentations. **If your country is not listed on this list, but you believe you could contribute to this course, please do not hesitate to contact. These are the top-eight economies in the world, and is not an exhaustive list. Ultimately, eight facilitators from different countries will be chosen. No more than eight facilitators will be chosen. What is expected from facilitators? All facilitators must be present for the first session, which will be during a weeknight at a bar or restaurant likely in the Calle 93 or Zona G area in early April (approximately). During this session, students will have 10-15 minutes of one-on-one time with each facilitator so that  students can be exposed to you and your culture  students can ask facilitators general questions about their culture so that  facilitators can know what kind of information that students are curious about in order to have content ideas for the workshop they will facilitate. Food and drinks will be provided, and facilitators will be paid for their time. Following the first session, we will begin a series of workshops on Saturday mornings (either 8-10 am, or 9-11 am TBD) in Chapinero (near the Calle 53 Transmilenio). Facilitators will have two hours during which they will give a powerpoint presentation with insights into their country’s business culture. Projector and HDMI connection provided. Before giving your presentation to students, you will be requested to go through your presentation in a web session with the course administrator. Schedule – Since each facilitator is giving one workshop, we will determine a Saturday that works both for your schedule and the course schedule. Classes will not be held on holiday weekends. The course will start as soon as eight candidates have been matriculated, approximately early April. The course will end, approximately, in July. Content – After the first session, you will have a good idea of what students want to know about your culture (and, as a person with experience both in Colombia and your culture, you will know what is most relevant to share). Renumeration higher than market average – you will be compensated for your course time, time at the first session, preparation time and time web-session to preview your materials. Networking – Network with high-level business professionals in Bogotá, and other teachers. Learning – Feel free to join a session to learn about a culture different from your own! Course is free for final facilitators. Questions, Doubts, Comments? Interested in collaborating as a facilitator? Reach out! Please use the following form to contact us, write or call Warren 321.288.4799 on whatsapp. Seeking a Colombian graphic designer to collaborate in the design of an e-store. Graphic designer will collaborate to make indigenous-inspired designs for both the website, social media and a product portfolio. Preferably, the graphic designer will have a good level of English as all textual components of the design will be in English. No graphic production will be in Spanish. Do you have what it takes? Reach out! Please include any relevant content from your portfolio and write us with the contact form below. Myth 1: I can only take the test once. Nope! You can take the IELTS as many times as you like; there are no limits. 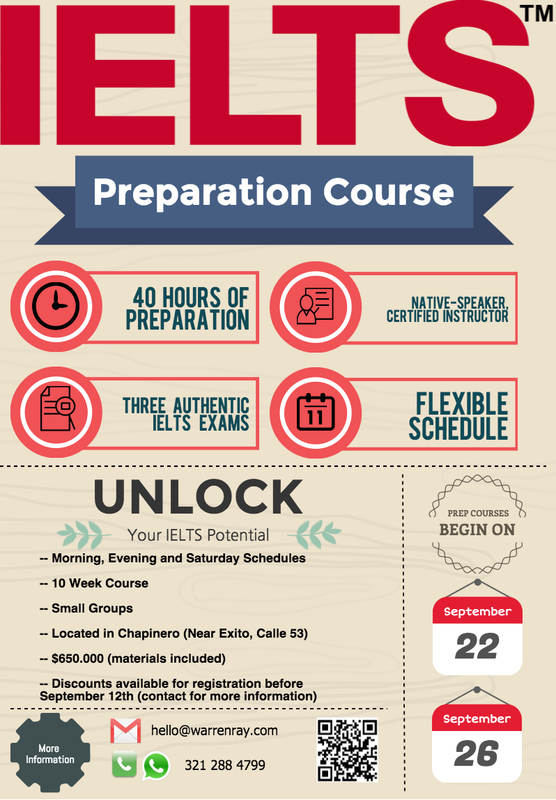 Each time you take the IELTS, though, you must pay the full exam fee (498.000 COP in Colombia). You can find test dates at the British Council on this page of their website. Myth 2: The IELTS is a British exam. The International English Language Testing System (IELTS) is an international exam which evaluates your ability to listen, read, write and speak in English. Two IELTS exams are offered: the Academic IELTS and the General Training IELTS. In function, the IELTS is very similar to the TOEFL exam. This Cambridge English Exam is accepted by academic institutions in the United States, the United Kingdom, Australia, Canada, Ireland, New Zealand and South Africa. More than 3,000 academic institutions in the United States accept this exam as well as employers worldwide. The IELTS exam is a requirement to immigrate to Australia or New Zealand. If you’re thinking about studying or are looking for work in an English-speaking country, the IELTS exam is just as important as your passport. The IELTS exam has an academic version and a general version. Each version tests your reading, writing, listening and speaking skills, but have slightly different writing and reading tasks. The test is completed during two separate days. On the first day you complete the listening, reading and writing sections, and then a few days later you complete a 11-14 minute speaking exam. The speaking exam is a three-part interview in which an examiner will ask you questions about topics familiar to you, ask you to speak at length about a given topic, and evaluate your ability to analyze and speculate about issues. From start to finish, the test lasts under three hours. The IELTS is not taken on a computer. Preparation is key for success on the IELTS exam – What are the sections of the test? How much time is allowed for each section? How many questions are there? How long must I speak? How is my writing evaluated? Knowing the answers to these questions can be the difference between being accepted into an academic program, or being rejected. My IELTS Preparation Course will ensure that you are prepared to present the IELTS exam on test day. From registering for the test to preparing for the speaking exam, my course will certainly contribute to your IELTS success. Suzanne Vega is a singer-songwriter who was born in California in 1959. Her eclectic style has marked her career as a folk-inspired musician. One of Vega’s most famous songs is Tom’s Diner. In this song, she sings about things she sees while sitting in a diner in New York. Since Vega sings about actions in progress she uses the present continuous (also called present progressive) lots to explain what she sees! The present continuous is formed with the verb to be + a present participle. There are several reasons why we use the present continuous. We use the present continuous to talk about temporary actions that are happening in the present moment or around the present moment (that is, immediately before, during or after the present moment). Why are you smiling? Did someone make you happy? Tom is on his way to the party. He just told me that he is on the bus!